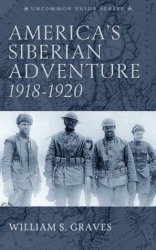 America's Siberian Adventure 1918-1920, first published in 1931, recounts the campaign by American troops to ostensibly stabilize and bring peace to a region beleaguered by several long-standing conflicts. Author William Graves, the General in charge of the expeditionary force, had to contend with Russian warlords, the Red Army, a roving brigade of Czechoslovakian troops, the need to protect the Trans-Siberian Railway, extreme weather conditions, and the regular armies of the Japanese and British. These conflicting factions, plus the ill-defined nature of the mission were a recipe for potential disaster. However, credit must be given to the level-headedness displayed by General Graves as he worked desperately to keep a low-profile for American troops and avoid 'adding fuel to the fire.' After struggling for two years, American troops were withdrawn, with little to show for their efforts apart from the unfortunate loss of 189 soldiers. Included are 9 pages of illustrations. A related effort known as the North Russia Expeditionary Force experienced 235 deaths from all causes during their 9 months of fighting near Arkhangelsk.